Not all bowie knives are made equal, and this Mexican Bowie is proof of that. This wicked blade features all the typical hallmarks of a bowie knife while possessing a distinctive handle and a subtly styled blade that is as deadly as it is quick. 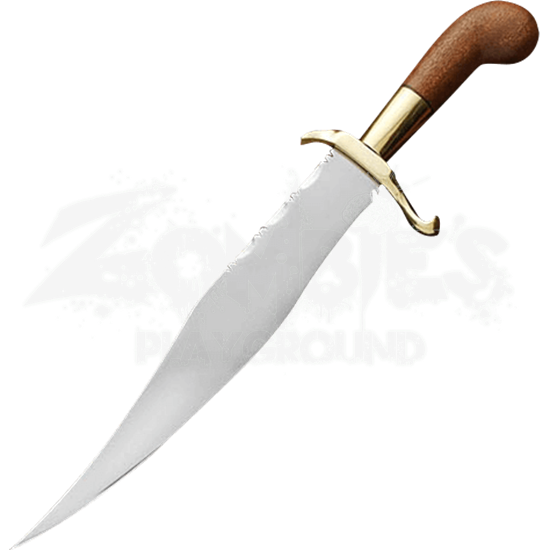 From afar, this knife would look like a classic bowie knife, as it possesses a traditional clipped point and a broad blade that usually typifies a Bowie. Up close, though, is when the details start to make this knife stand out. The clipped point blade is crafted from 1085 high carbon steel and has a single factory edge on one side, although it can be sharpened and honed later to improve the knifes keenness. The blade also features elegant filework along the back edge. The solid brass finger guard and bolster are equally distinctive, while the solid wood handle is easy and comfortable to grip, thanks in part to the contour and the knob-shaped pommel. The knife includes an embossed leather belt sheath that is perfect for keeping the knife at your side wherever you go. The knife has an overall length of 16.25 inches, while the blade measures approximately 10.75 inches. 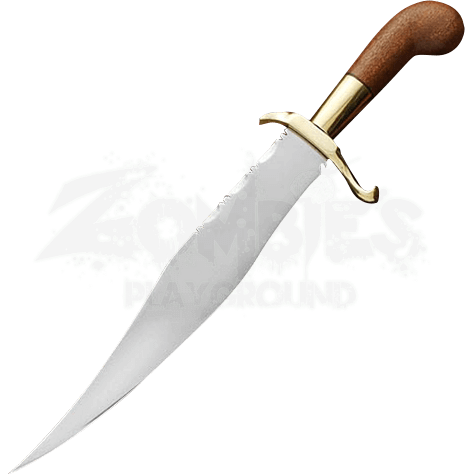 Deceptively fast, this Mexican Bowie is a great weapon to take with you whenever you head out into the wilds, either for camping, hunting, or just for a walk, as you never known when you are going to need a good hardy blade like this one.